Recently, we watched the movie Faith Like Potatoes and it made me think a lot about our sweet potato project. You can’t see what is growing beneath the ground, you just have to have faith. I try to look at the positive in all things, which I have a hard time doing. Sweet potatoes aren’t suppose do well or even grow at all in our area . . . . . they grow in warm climates and are of tropic origin, our climate is far from tropical . . . . . . so we set out to do the impossible once again, to grow sweet potatoes. We had to see for ourselves what would happen when we planted those unusual sweet potato slips. Honestly, we expected the project to be a failure. But, I guess, deep down we had to have a little faith and just not realize it or we wouldn’t of even bought the slips and planted them to begin with. We expected a crop failure, but honestly it wasn’t that bad. Harvest is much different than regular potatoes, aka Irish potatoes that Idaho is famous for growing, which takes getting used to. 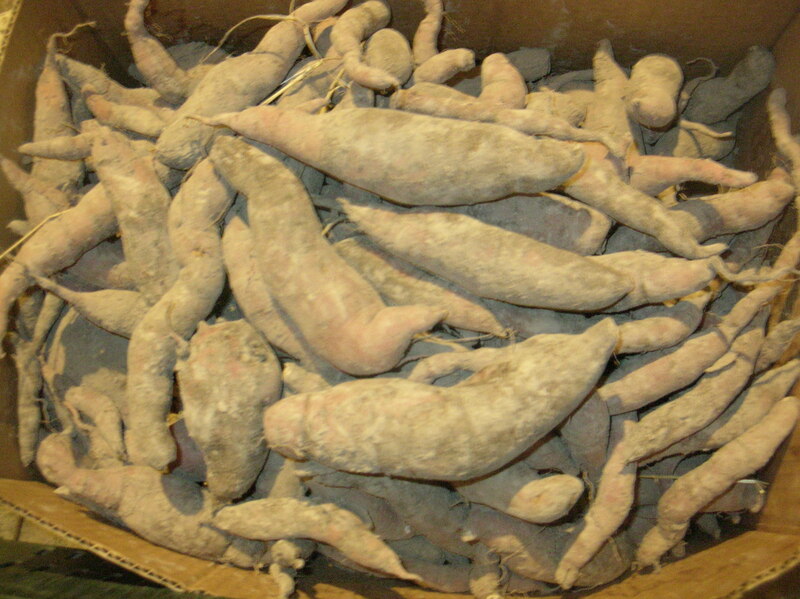 Sweet potatoes are a root and not a tuber like Irish potatoes. The root is about 20 inches long with a swollen part in the middle that is the actual sweet potato. There were some that had two swollen parts or sweet potatoes on one root. The whole root thing makes them harder to dig and get out of the ground. You have to start digging 18 inches away from the plant, being careful not to poke or scratch the roots. They bruise easily. We have learned they need lots of room to grow. The ones that were planted 24” apart as recommended had all small tubers, but the one that we planted 36” apart had larger tubers under them. And the vines spread and cover several rows and any plants that are growing near by. To make digging a little easier, we mowed the tops of the plants off before digging. And as with most task around here, we did it the hard way; we did all the digging by hand with a digging fork. Though we had a couple of nice sized potatoes per plant, there are a lot of small tubers. But, hey, they grew and we have sweet potatoes! Sweet potatoes are not very sweet when they are first dug. They have to sit and cure at a warm temperature (80 degree F) for 10 days to get their sweetness and set their skin. After they have cured, they need to be stored in a cool, dry location that stays above 50 degrees, ideally between 55 – 60 degrees, and should never be refrigerated (until after they are cooked, of course). After digging those large sweet potato roots that never should’ve grown in our soil, it makes a person think and believe. It was amazing to see those large tubers come out of our soil. This project has taught me to have faith no matter how impossible the task, project or plant may seem. Have faith no matter how impossible things may seem or how many times you are told it can’t be done. Very informative! I never knew about sweet potatoes and what a lesson in faith!